Stella Pope Duarte was born and raised in la Sonorita barrio in South Phoenix. She began her writing career in 1995 after a dream in which her deceased father related to her that she was destined to write. She holds a B.A. 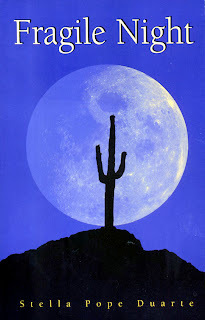 in education from Arizona State University, and an M.Ed in Educational Counseling. 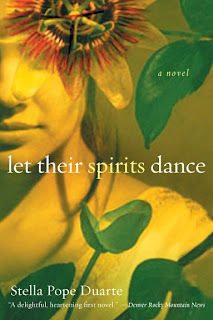 Duarte has been awarded two creative writing fellowships from the Arizona Commission on the Arts for Fragile Night (Bilingual Press, 1997), her first collection of stories, and for a novel, Let Their Spirits Dance (HarperCollins, 2001). In 2000, she was nominated for the Pushcart Prize in Literature. 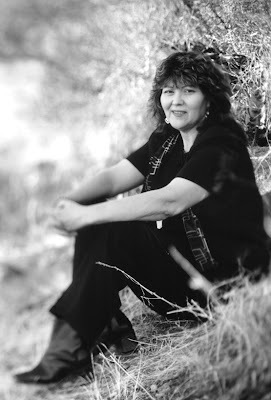 In 2004, she received the Barbara Deming Memorial Fund Award for an excerpt from her new novel, If I Die in Juárez (University of Arizona Press, 2008 Spring release), and in 2005 she was honored with the Outstanding Alumni of the Year Award by the American Association of Community Colleges. Governor Janet Napolitano appointed Duarte as a member of the Arizona Commission on the Arts in 2006 for a three year term. She is a highly sought-after inspirational speaker for audiences of all ages, on topics related to her work, as well as on issues related to: women's rights, culture, diversity, leadership, education, literacy, Chicano/Latino history, writing, and storytelling. 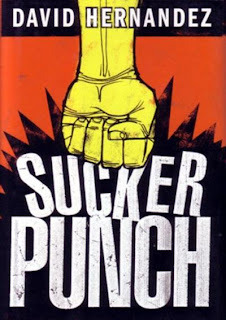 I soon will be reviewing Duarte’s new novel for the El Paso Times. In preparing my review, I posed several questions to Duarte to give me some insight into her writing process. I will be using some of her comments in my review but she kindly agreed to allow her complete responses to be published here on La Bloga. First, some background. Her new novel, If I Die in Juárez, concerns the maquiladora murders, the horrible crimes against young Mexican women who worked at the factories in Ciudad Juárez, the city that borders El Paso. These factories sprang up in the wake of NAFTA and held the promise of plentiful jobs. Duarte uses three young women to tell the story. 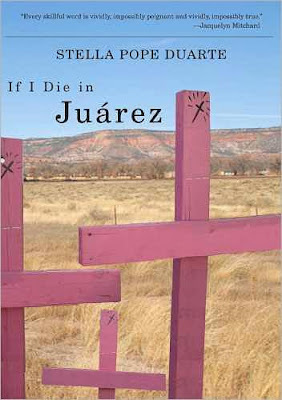 OLIVAS: Why did you decide to use fiction rather than non-fiction to write about the dead women of Juarez? DUARTE: This story is a very painful one not only for victims, but for their families and friends as well. It continues to occur in our midst, so it is something very present. Several documentaries, books and films, and numerous articles have been written, however, a story told from the perspective of three young girls has not been done in this way. I also was cautious about protecting the identity of the women as I know there are retaliations from police and investigators. With these things in mind, I felt a creative story built around the facts would be best. OLIVAS: In your extensive research for the novel, was there a moment when you felt simply overwhelmed by the subject matter? DUARTE: Absolutely, lots of times. The worst was when I read details of the mutilations. Knowing what had been done to the bodies, and seeing photos of remains, mummifie d faces -- that was the worst ever. I would have run away from it all, but the story haunted me, held me fast. Books look for me. Since the dream of my dad, telling me to write, I tell you stories are searching me out. OLIVAS: Why did you decide to use three females of different ages and backgrounds as your protagonists? DUARTE: Good question. I struggled to find out who would best tell the story. I can't tell you how many drafts I wrote, as I lost count! I had to have a woman in the maquiladora, then I had to have one who lived on the streets, and then I wanted to show the extreme poverty of Juárez, and so was born Mayela Sabina, my Tarahumara. I couldn't let any of them go, they were meant to be there together, young, fragile and targets for abuse and murder. I had to go back and forth to Juárez as I couldn't believe the poverty. Anapra, is "Los Tres Magos," in the novel -- one of the poorest of the poor areas in Juárez. Also, as an omniscient storyteller I was able to get into the minds even of the cartel, Hilo, the bodyguard, and the hideous "Cucuy." I believe the lives of the working poor come alive in different layers through the three girls. I'd like to add that dreams are very important to me. I had a dream of a dark, red room where terrible things w ere happening, the night before my first interview with a reporter from El Diario. I woke up disturbed over this dream. During the interview, the reporter related to me that she was sure the girls were taken somewhere and tortured, perhaps "snuff films" were made of them. Forensics showed that in many cases, if a girl was abducted in say March, body tissues showed she had not been murdered until April or later. When the reporter said this to me, I knew one of the places where they had been taken…the dark, red room I had seen in my dream. You will read about Petra de la Rosa in the dark, red room. In another coincidence, Petra's name "appeared" in my mind before I saw it on a list of murdered women (first name...she was the ONLY Petra). I knew she would guide the story, and she did! ◙ Daniel Alarcón, author of Lost City Radio (HarperCollins), tells us that Etiqueta Negra's collaboration with n+1 continues with a profile of Keiko Fujimori, daughter of former Peruvian dictator Alberto Fujimori, written by the journalist Paula Dongo. You can read it in English here, or in Spanish here. ◙ The National Book Critics Circle Award: Every year the NBCC presents awards for the finest books and reviews published in English. Below are the 2007 winners. Of particular note for La Bloga readers is the winner for the prize for fiction: Junot Díaz, for his novel, The Brief and Wondrous Life of Oscar Wao (Riverhead Books). 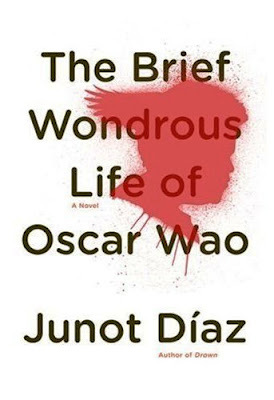 Junot Diaz, The Brief and Wondrous Life of Oscar Wao (Riverhead Books). Harriet Washington, Medical Apartheid: The Dark History of Medical Experiments on Black Americans from Colonial Times to the Present (Doubleday). Tim Jeal, Stanley, the Impossible Life of Africa's Greatest Explorer (Yale University Press). Edwidge Danticat, Brother, I'm Dying (Knopf). Alex Ross, The Rest is Noise: Listening to the Twentieth Century (Farrar, Straus and Giroux). Mary Jo Bang, Elegy (Graywolf Press). Sam Anderson, New York Magazine. Winning entries of the SPD will be showcased in its 43rd Publication Design Annual, as well as featured online and at the SPD Awards Gala held May 9, 2008 at the Hammerstein Ballroom in New York City. 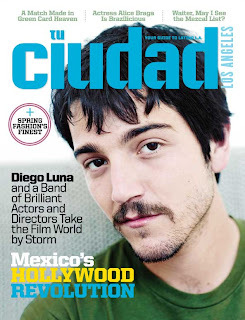 Since its launch in June 2005, Tu Ciudad has received a total of four awards from the SPD and recognition from the City and Regional Magazine Association (CRMA) and New America Media Awards. ◙ That loco, Bill Nericcio, let us know that his “littl e-engine-that-could volume” Tex[t]-Mex (University of Texas Press) was awarded a CHOICE award by the American Library Association as one of the top ten "Outstanding Academic Titles" in Film Studies for 2007. 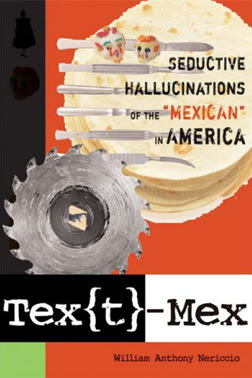 Additionally, it has been nominated for the Modern Language Association (MLA) Latina/o Cultural Studies Award, Arizona State University's Transdisciplinary Humanities Book Award, and, lastly, the 2008 Human Rights Section of the American Political Science Association (APSA) Best Book Award. More info on these is here on the upper right. ◙ I want to thank the Department of Chicano Studies at Cal State L.A. for hosting our “sneak peek” of the forthcoming Latinos in Lotusland: An Anthology of Contemporary Southern California Literature (Bilingual Press), which I had the pleasure of editing. The anthology brings together Los Angeles ficti on by 34 Latino/a writers going back to 1947. 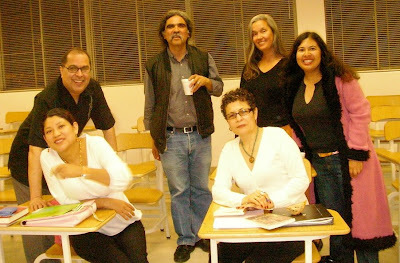 The contributors who appeared (pictured) were Reyna Grande and Helena María Viramontes (sitting), and me, Danny Romero, Lisa Alvárez, and Melinda Palacio (from left to right, standing). The students, professors and other guests were wonderful and the evening was filled with energy and pride. The book is at the printers and will be out very soon. You may pre-order through any online seller or order through your favorite bookstore. There will be many more events later this year. The photo is courtesy of Melinda Palacio. It's tough to watch featherweight Brian Ramirez facing one of the biggest challenges of his 21 years. He clutches his hands together, takes deep breaths and closes his eyes, as if to steel himself for what he's about to do. But it's not a championship fight he's facing. 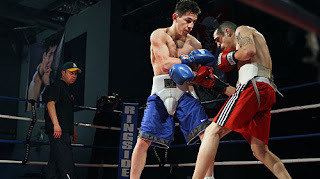 It's the taping of an endorsement for the sponsor of a new reality TV show, "Retador Azteca," or "Aztec Challenger," that pits teams of Latino boxers from both sides of the border against each other. Ramirez, a Mexican American from El Monte, sits at the edge of a leather-and-suede sofa donated by a furniture company and reads from a short pitch written on a sign board. To read the entire piece, click here. Remember, if you have story ideas for Agustin, email him at agustin.gurza@latimes.com. Another chingon post and so much good news from Aztlan. Keep it up, Daniel. Great bloga. Daniel, have you ever reviewed the investigative book by Diana Washington Valdez about the Juarez murders? (The Killing Fields: Harvest of Women in English and Cosecha de Mujeres in Spanish.) It's horrific and well researched. I read she's going to be on a panel in El Paso, Texas with Stella, and they're also showing the documentary based on Diana's book "Border Echoes" on TV. I look forward to the prose.